Do you appreciate fine art and good company? 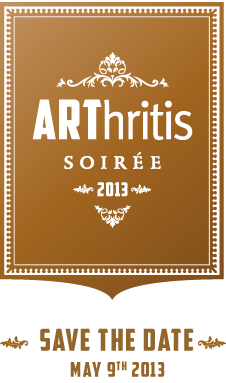 If so, you are cordially invited to attend the 2013 ARThritis Soirée, the first annual signature fundraising event for the Arthritis Research Centre of Canada (ARC). This elegant, yet fun, cocktail reception and art exhibit will bring together business and community leaders, healthcare professionals, and others like you who share an appreciation for art and a desire to support arthritis research. Guests will enjoy an incredible evening of entertainment, delicious hors d’oeuvres, raffles, an art auction, and more. Please join ARC as they launch this exciting and new event on May 9th at the Vancouver Art Gallery. The ticket price is $245 per person. Attire is semi-formal.